Yep, it’s that time of the year again. Start thinking about the C word. 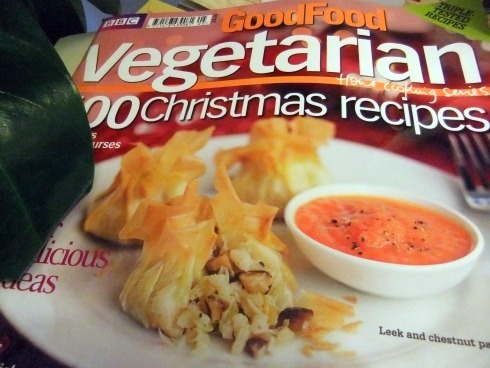 Marked in the Organikal Kitchen for the last 5 years by the publication of BBC Good Food’s Vegetarian Christmas issue. First impressions? It’s all gone a little upmarket compared to previous years. Maybe it’s just the typesetting and design, but on first read through, there’s nothing much inspiring me to take action It’s all a little restaurant-inspired for my taste. Oh, how I laughed as I imagined Martin’s face when I presented this starter to him. 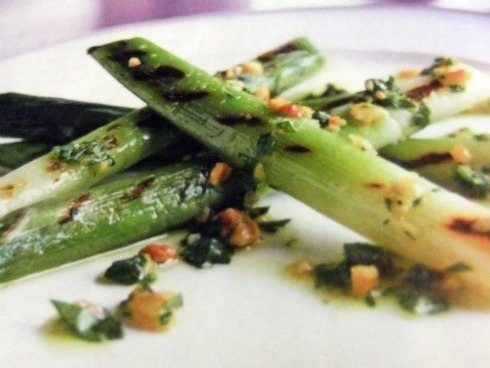 “Full of Christmassy flavours”, no doubt – but definitely not one we’ll be recreating here in the Organikal Kitchen. Anyway, we don’t deal with starters anymore at Christmas. There’s so much to the main course, no one is interested in a starter. I do like the look of the Wild Mushroom Tartlets and can see myself serving these to friends, but my Mum hates mushrooms, so that’s not one I can get past the family. Hummus and Dips arrive next. Look, we don’t really need a recipe for these. It’s more of an idea. Not one for Christmas Day, but for party season it does no harm to stash a few ideas away… and next, Sherried Squash Soup. Squash Soup with sherry added. Hmmmm, an autumn favourite made Christmassy with a drop of sherry. Again, not for me Omelette Vegetable Rolls is the final offering in this wee chapter. I can’t see me getting around to it. I combine my veggie main course with a traditional Christmas roast to cater for all the family, so it’s often the case that the Mains suggested just won’t work alongside the other components. Spiced Potato Cake With Mint Raita case in point – but a useful dish for a dinner party at another time, definitely. Roasted Vegetable Lasagne? No, really, you are mistaken. Vegetarians eat vegetable lasagne all year long – we don’t want to face one at Christmas. We really don’t And if you’re not veggie and you’re planning on making a vegetarian meal for friends or family, please just give this a miss. Your veggie friends will love you for it. Chilli Potato Stack with Squash next up. Too faffy for me, what with everything else going on. Oh, how difficult am I? Perhaps if I was serving an elegant dinner for me and the husband, this might work – but for a family of eight. It just isnae going to happen! Mushroom & Goat’s Cheese Polenta Pie I think this is one I’ll definitely give a shot. Alas, not for Christmas day itself… Really difficult to please, me. 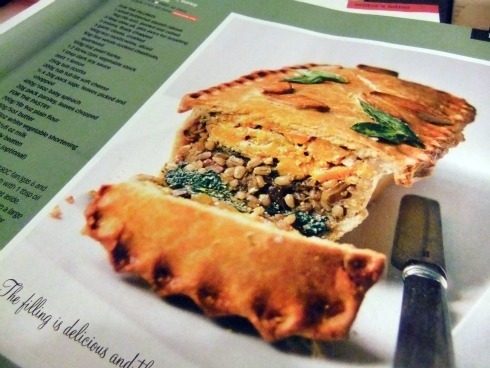 Layered Squash, Barley & Spinach Pie Now we’re talking! This looks really fabulous and delicious and just perfect. But oh, it looks very complicated for Christmas Day morning Perhaps I can do it the day before? Or maybe even the day before that? Doesn’t it look deliciously scrummy? The Creamy Risotto Layer Cake is a definite no-no and I can’t get hold of any fennel at this time of year for the Fennel & Gorgonzola Souffle Tart, so that’s out, even if I was moved (I do love a wee bit of Gorgonzola, but there’s no veggie version, is there?). There’s loads more in this issue, including some special recipes contributed by The Vegetarian Society. Personally, I’m not moved – there’s a lot of tomatoes in there (at Christmas! which veg box supplier does the BBC use?) and stir fries – my very least favourite type of meal.